At WebRanking, we are dedicated to our own continuing education in the industry we have been apart of for over a decade. So when I recently discovered the “Essentials of Online Marketing” course that is offered through the Online Marketing Institute, I decided it was time to brush up on a few internet marketing areas that fall outside the search box. The Online Marketing Institute has developed a certification program in conjunction with the Warton Interactive Media Initiative and the “Essentials” course is just designed to be an introduction to online marketing on seven areas of specific online marketing subjects that will be taught as separate and more in depth advanced learning certification courses to be available soon. This was a good reintroduction to other internet marketing avenues that I had long overlooked as some of them are not part of our core group of services that we have offered to clients in the past, like Email Marketing, Demand Generation and Website Usability and some we are seeing more client demand for like Social Marketing. The “Essentials” program consists of ten modules (10 credits), including seven required modules listed below (7 credits) and three elective modules (3 credits). The course took me over a week and a half to complete the video modules and electives. It also came with a three ring binder with screen shots from the videos and areas to write notes next to them, that really helped in writing good ideas down to follow up on later and in learning retention. 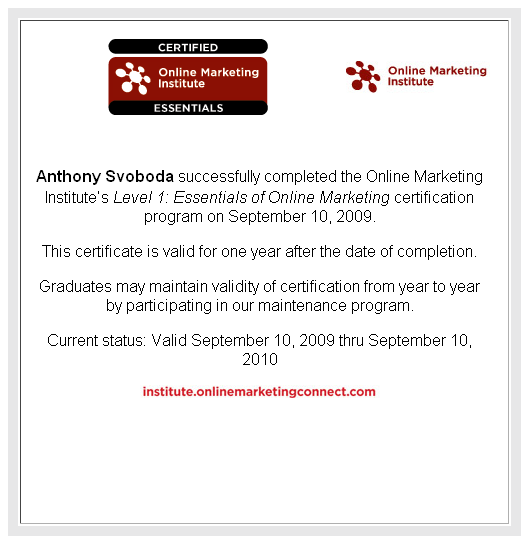 The Online Marketing Institute will soon have four levels of education. Level 1 (Essential in Online Marketing) is currently available, Level 2, Level 3, Level 4 and a Bonus Level (Guru), all will be available soon, and will cover the seven specific topics of online marketing listed below. Each course subject at each level will take between 12 and 20 hours to complete. Social Media: Steve Ennen from the Wharton Interactive Media Initiative. Analytics: Jim Sterne from the Web Analytics Association. Strategy and Planning: Steve Latham from Spur Interactive and Houston Interactive Marketing Association. Website Fundamentals: Olivier Chaine from Magnify360. Website Usability: Carol Farnsworth from Keynote. Search Marketing: Ben Hanna from Business.com. Paid Search/SEO: Kent Lewis (local Portland guy) from Anvil Media and Formic Media. Email Marketing: Joel Book from ExactTarget. Email Deliverability: Stephanie Miller from ReturnPath and Email Experience Council. 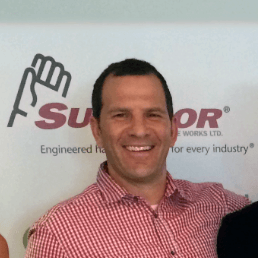 Demand Generation: Rhonda Wunderlin from Eloqua. Guest speakers include many top industry experts like Eric Peterson, Kevin Lee, Thad Kahlow, Ray “Catfish” Comstock, Tim Ash and Abe Mezrich to mention a few. Continuing education in online marketing is important, as it is a fast paced and constantly evolving industry. Just look how blogging, tweeting, Facebook, YouTube and even sites like Yelp have gained in popularity and can be entire marketing efforts in their own right. You can keep up with all the latest industry info and how-to’s from blogs, e-newsletters industry publications, conferences, seminars and people you know, but I think you should have at least some form of formal or structured education that gives you a solid foundation and deeper understanding of the subject matter to continue to improve your skill set. I am personally looking forward to the next course levels in the areas of SEO/Search Marketing, Web Analytics and Website Usability. It sounds like a well structured and fairly comprehensive course. What was the best thing about it?